SPOILERS AND PURE SPECULATION AHEAD! I’ll admit, I’m making a bit of a reach here in guessing the Star Wars VII plot. No shame in that. I’m going out on a limb based on bits from two different articles from AintItCoolNews‘ Harry. Specifically “Harry gets all STAR WARSY again” and “STAR WARS EPISODE VII’s working title is… you didn’t think I’d blow it in the headline did ya?“. It’s been said that the events in SWVII will take place approximately 30 years after the Battle of Endor. If you follow the expanded universe that falls squarely in the Dark Nest trilogy which was a very mediocre series. However it’s right after the Yuzhan Vong invasion which would make GREAT movie material, and right before the rise of Darth Cadeus which would also make for GREAT movie material. 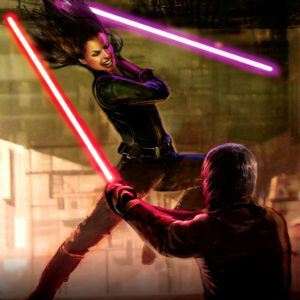 Shortly after both of those entries, however is the Fate of the Jedi series. Now, as a story, it’s very good and includes a Lost Tribe of Sith… but I don’t know how a “force entity” like Abeloth would come across on screen. So while the time is approximately right for any of those 3 storylines, I didn’t think Fate was a good fit. As we get each revelation, each bit of knowledge… let it fly with your imagination. I know people that felt burned by the prequels, but I recommend to everyone to watch the whole of THE CLONE WARS series – it may even evolve your feelings about the films. You might see that I was right all along… giggle. Seriously though… it is THE CLONE WARS. It is what the films were missing and it is epic. Some of the best STAR WARS action you’ll ever see – but also – you learn what’s up with the disappearing and the Force Ghosts. You get greater depth upon Palpatine, Anakin, OB1, Yoda – and even Jar Jar is greatly redeemed. Dave Filoni did tremendous work on that show and should really be heralded for it. You see… in the Clone Wars cartoon there was a VERY weird episode where Anakin disappears from known space and interacts with a Father and his son & daughter. The son represents the dark side and the daughter is the light side and the father keeps them in check. Well the father ends up dying and Anakin was supposed to stay in the father’s place but he chose to leave instead, which left the force in IMBALANCE. It was a very weird and out of place episode. In the Legacy of the Force series it turns out that the balance was keeping the entity known as Abeloth in check. And without that check she is free to wreak havoc on the galaxy (far, far, away). In “STAR WARS EPISODE VII’s working title is… you didn’t think I’d blow it in the headline did ya?” Harry says the working title of the next movie is “STAR WARS EPISODE VII: THE ANCIENT FEAR“. That fits with the Abeloth story line since she is ANCIENT and she invites fear. The lost Tribe of Sith could also be considered ancient and they are heavily involved in the story as well. Well, first is that they’ve said they aren’t using any of the expanded universe for the movies. The only “canon” in this is the movies to-date and the Clone Wars series. I think that’s a little disappointing since there are some GREAT stories in the expanded universe so it would be a shame if they didn’t use any of it. And I’m also disappointed that the Clone Wars canon includes a pacifist Mandalorian race. Additionally, Chewbacca is in this movie. If you follow the expanded universe, he DIES at the beginning of the Yuuzhan Vong invasion. I will tell you right now, if that happens, I will be WEEPING openly in the movie theater. But DAMN if that won’t be a memorable moment in movie history. Anyway… if he plays in anything other than a flashback then he can’t be in this storyline since he’d already kicked the bucket by the time Cadeus or Abeloth or the lost tribe of sith come around. New Jedi Order series (the Yuuzhan Vong invasion), check it out from Amazon HERE. Legacy of the Force series (rise and fall of Darth Cadeus), check it out from Amazon HERE. 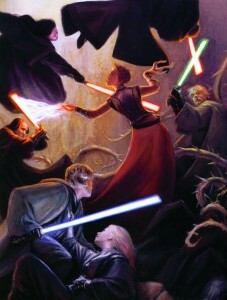 Fate of the Jedi series (Abeloth and the Lost Tribe of Sith), check it out from Amazon HERE.